Area itineraries provide itinerary examples for different areas, including Taipei, Taichung, Nantou & Chiayi, etc. However, lots visitors also want to know how to plan an entire itinerary. 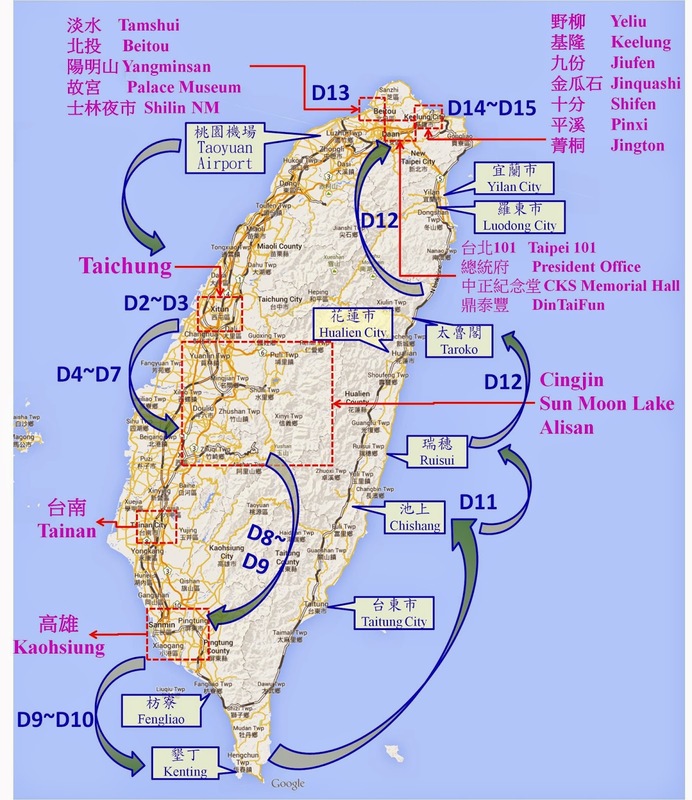 Basing on area itineraries, here are some Taiwan itineraries. Remember, the following examples just show how to make a smooth itinerary plan. Some information may be out of day. You should check the timetable and traffic condition before finish your own itinerary. 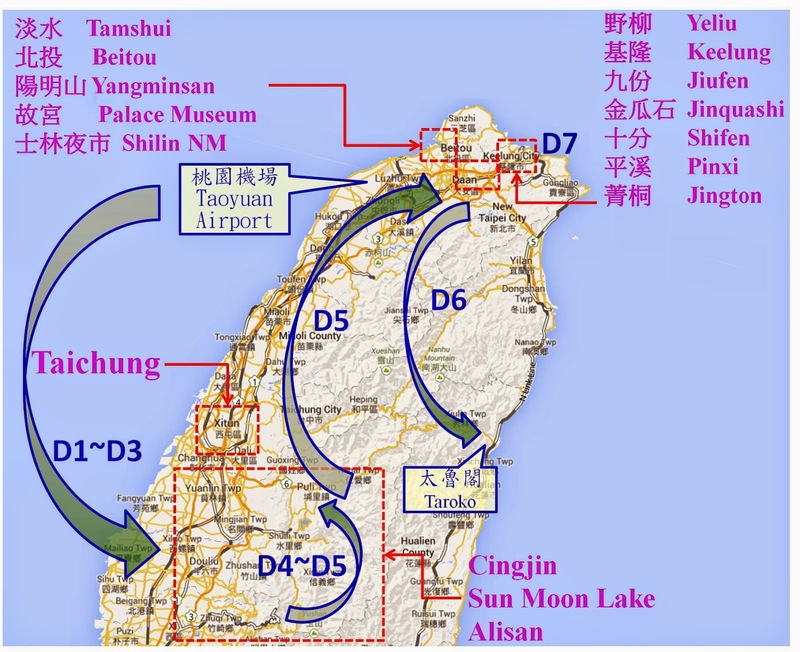 The following 15 Days itinerary is a counterclockwise round island itinerary. It starts from Taichung and finishes in Taipei. The itinerary includes most popular attractions for foreign visitors. Although you don't need to follow the itinerary, the information about inter-area transportation within the itinerary is useful for you. 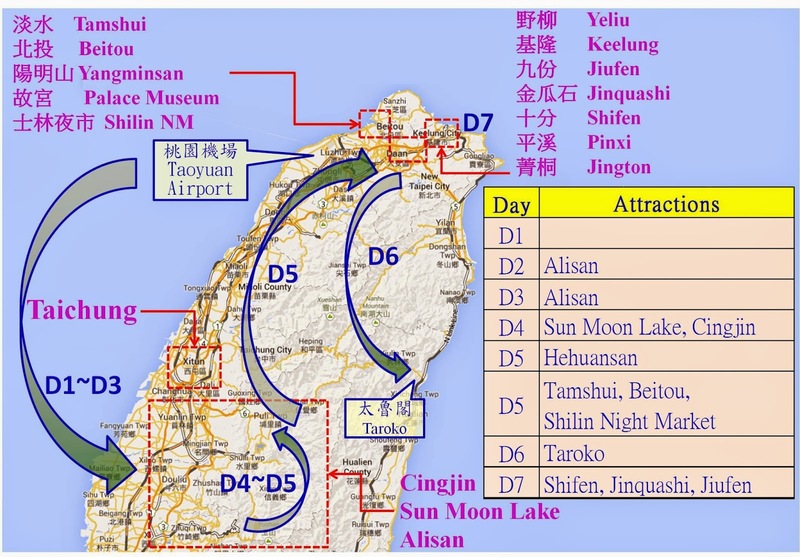 The following 7 Days itinerary cover most attractions in middle and north Taiwan. It also provide the one-day itinerary of Taroko, in which you can go to Taroko from Taipei and return in the same day. You can also take Alisan Forest Railway from Chiayi to Fenchihu, which crosses four forest areas – tropic, subtropical, temperature and the frigid zone. You will see how the forest train climbs by the unique Z-shaped switchbacks. Hi. I'm planning for a trip to Taiwan this June. Will be there for like 7-8 days. Do you think there will be enough time for me to visit Hualien, Sun Moon Lake, Cinjing, Alisan and Farmosan Aboriginal Cultural Village? I would have to keep 3 days for Hualien coz am visiting a friend there. Wanted to visit the Lavender Farm in Kaohsiung as well but most likely will be impossible. Please advise. Thank you. Ok. I think I will skip those and probably the Farmosan Aborginal Cultural Village as well since it's an amusement park. Prefer to enjoy the nature. If I need any advice will ask again yah. Probably after I've planned my iterinary will ask you if it's ok or not. Thank you so much!!! Hello. Sorry to disturb you again. I'm contemplating how I should go to Alishan. Will it be easier and nearer to go from Taichung or Kaohsiung? And do you recommend a night stay in Alishan or I should just make it a day trip? Chiayi is in the middle of Taichung & Kaohsiung. Not much difference. I would suggest that you can stay overnight at Alisan since it takes 2.5hr on the winding mountain road. And you won't have time to enjoy the forest railway. Ok. Is there any recommended place to stay in Alishan? Ok. Thank you very much for your recommendation. Hello again. I'm trying to find the best way to go from Cinjing to Hualien on 23 June which is a Thursday. Not too sure if I should travel the mountain roads or go down to Taichung and from there to Hualien. I understand that either way, both will take quite a long journey as well. Any better suggestion? By the way, I've narrowed down my place of visit to Alishan, Sun Moon Lake, Cinjing, Hualien and Taipei. Reaching and leaving Taipei 19 June 2pm and 27 June 10am. Please advise what's the best route I should take. Thank you!!! For the transportation, please refer to another post "Bus Trip Between Hualien & Cingjin"
The Key: can you book the shuttle bus between Cingjin & Hualien? Ask the help from your hotel host. If you cannot book, follow itinerary 2 above. Stay at Taipei and move to Hualien. Go to Hualien via Taipei from Cingjing directly is exhaustive. Ok. Thank you so much. I will ask the hotel that I'm staying to assist me. I found out some travelers will get a cab from Cinjing to Hualien with stops in few other places. Do you have any experienced and good cab driver that you can recommend? If there are family with you, hiring a cab is a good choice. I'm afraid that I cannot provide list. You can find some lists in Tripadvisors. Since it is a full day driving, the price is around NTD 6000-8000. You can also ask your hotel host to hire a cab for you. Then the quality of the driver is under the guarantee of the host. Ok. Thank you so much!!! Thank you for posting this! I will only be in Taipei for 12 nights, so I am thinking of following your itinerary for two weeks except cutting out Taichung. That way I will also avoid going to Sun Moon Lake on the weekend (since I arrive on June 16, which is a Wed.). Does that sound good? Thank you for your input. Or would it be better for me to spend two nights in Taichung and go to Sun Moon Lake on a day trip? Technologically, both are doable. The choice depending on your preference. Hi Sullivan, I am going to travel for 15 days on 30 Oct - 13 Nov, going clockwise: Hualien, Taitung, Tainan, Alishan, Cingjing, Taichung, Taipei. I am thinking to rent a car from Hualien and drive myself because it saves time and more flexible. But I am worried about the mountain roads in Alishan and Nantou area. Is it safe to drive on our own? Is the GPS clear and reliable? 1. If you don't have experience along the winding road, drive slowly. 2. Confirm that you can rent and return the car at different places. Try the day trip itinerary examples of Taipei. It would be cold and raining at Mt Qixing in Jan. But you can go to Yanminshan for Cherry blossom. Yes, your itinerary is doable by taxi. D2 would be late. The trip may be over 12 hours and arrive Taipei after 9pm. I will be in Taichung on 26 & 27 February 2017. Where is a good place for cherry blossom in Taichung or nearby? Hi, will be going to Taiwan this coming November for 5 whole days. We already booked our accommodation at Taipei(specifically at Zhongshan). But we don't like to spend all our 5 days in Taipei only. Seeing your suggested itineraries, i'm considering a 1 day tour at any of the ff: alishan, toroko gorge, taichung, sun moon lake. Can you suggest me an itinerary pls? Thank you. Jiufen & Shifen is doable in one day from Taipei by train/bus. Taichung is 150KM away from Taipei. You can have one day trip for Taichung. However, you don't have much time for urban attractions.